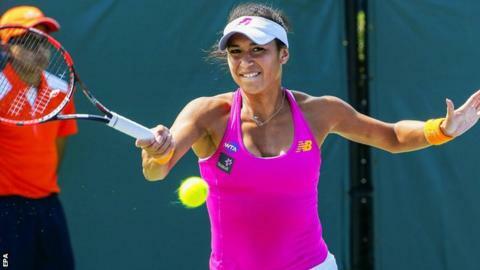 Briton Heather Watson took only 47 minutes to book her spot in the Miami Open second round with a 6-1 6-0 win over Petra Cetkovska. The 23-year-old world number 69 will now play 20th seed Sloane Stephens of the United States. In the men's event, British number three Kyle Edmund will face world number one Novak Djokovic after beating Czech Jiri Vesely 6-4 5-7 7-6 (8-6). Watson won her third WTA Tour title in Monterrey earlier this month. "I'm very happy with today," she told BBC Sport. "I don't think my opponent was at her best. "It will definitely be a tough next round against Sloane. We've known each other a very long time and she's a great player, a great all-round athlete." Edmund, 21, held his nerve in a gruelling two-and-a-half hour contest, eventually sealing victory on his fourth match point. "I knew I needed to hit out, don't go within myself," he said. "It was important not to get down on myself, otherwise it would have cost me." The world number 82 will now take on top seed Djokovic for the first time, although he did practice with the Serb at Wimbledon a few years ago. "I'm very excited," said Edmund. "It will be a tough match, he's obviously the guy to beat at the moment. It will be a great experience just to see where my game is at."